Pudding filled tarts, you choose your favorite, Frangelico with vanilla pudding or chocolate. How about lemon pudding? Coconut rum? What's your favorite? You can fill these with anything you like added to the pudding, or just by making a box of chocolate pudding then add Frangelico a few tablespoons will do, Chocolate Frangelico is the favorite here. Also, another fabulous addition is coconut and rum to the vanilla pudding after its cooled. Top with fruits, or whipped cream or even meringue and chocolate, whatever you choose as your favorite. A great picnic dessert! Make One Large One Or Mini Tarts! We love this filled tart with this decadent pudding. Topped with fruits it's a showstopper for any event or celebration! Mix all together except for nuts to form a dough and refrigerate 30 minutes. Put 1/4 teaspoon of crushed hazelnuts in greased tartlet mini pans or mini muffin cups. Add 1 tablespoon in mini tartlet pans. Shape to tin tartlet forms. Bake at 350 until edges start to brown. Cool, remove from tins on to wax paper. When completely cool fill with desired flavored pudding, top with fruit then 1/2 cup of favorite jelly microwave 25 seconds and use glaze topping over fruit. 1 tablespoon of Frangelico or Vanilla added last. Blend dry ingredients in a bowl set aside. Add milk slowly beating till smooth whisk in yolks, cook till thickened add vanilla. Cool, set aside until ready to fill a large tart or make tartlets. These fruit tartlets look so cute and pretty! These look so cute and yummy! I love the colors too. Perfect party tartlets! These are as pretty as they sound delicious! Excellent summertime dessert with all the fresh fruit. Oh Claudia the tarlets are beautiful! I wish I could find time to try all of your desserts! these are too cute! they look sophisticated, but fun! perfect for a summer get together with all of the colors and options you have there. great post! These are so adorable, I love them! My girls would go gaga for these little treats. Mmmmm, Frangelico! So beautiful, too! Nom nom nom!!! 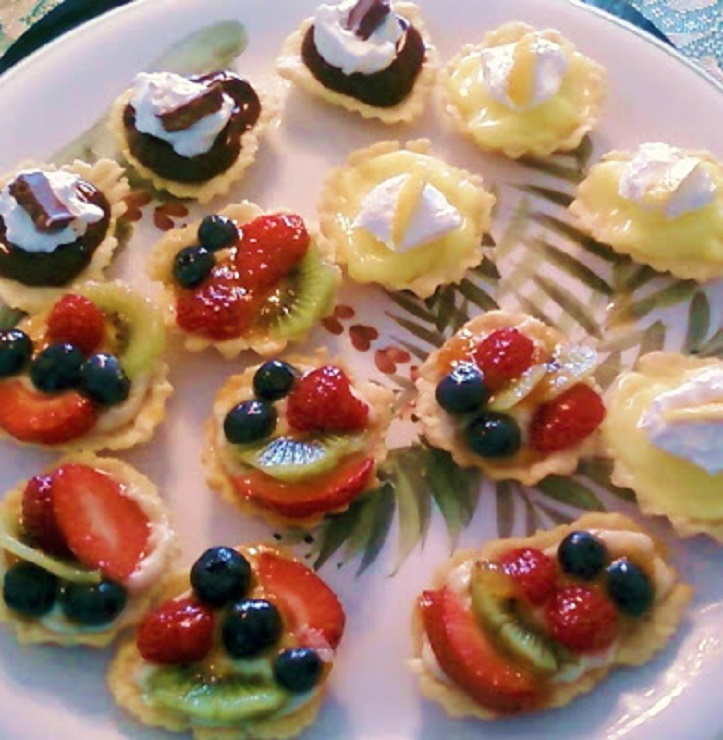 I make tartlets everytime we book a cruise, as this is what is all over the ship everyday anytime, so I am now in cruise mode! lol thanks for all the great comments everyone~! I love to hear your thoughts thanks again!!!! Sweet looking tartlets. You've got the same little tart tins that I've got.